A dashboard tutorial easily informs with the use of voiceover narration and animation technology. When Capario created a state-of-the-art, real-time processing platform that helps physicians, payers, and other healthcare organizations reduce claims processing costs and improve revenue cycle management processes, they also wanted to create tutorials to help users understand the tools available and how to navigate within them. For this, they turned to Dynamic Digital Advertising (DDA) and our in-house video production and animation services. 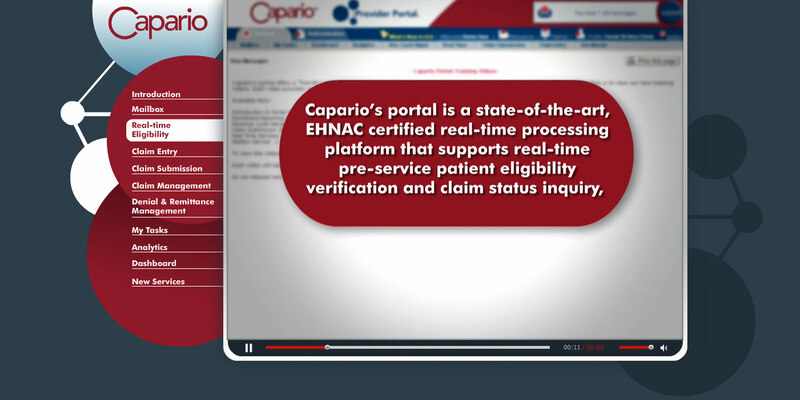 DDA Video would produce a series of training videos geared to teaching users how Capario’s dashboard operates. Through the use of voice-over narration, dashboard screenshots, and animated features, DDA would create a training tool that would not only inform, but would also motivate users to learn more. After conducting interviews with the client, DDA's writers produced scripts for almost 20 different video tutorials explaining Capario’s dashboard. The end result had a total run time of 40 minutes of detailed instructions from a voiceover talent chosen from DDA's Actors' Network combined with animated graphics that highlighted what the dashboard provided users. The narration was recorded in DDA’s sound-proof studios and edited by DDA’s professional staff of audio and video editors. Animation technology was used to guide the viewer throughout the process as they watched an on-screen icon follow the steps narrated in the video. DDA designed a graphic user interface to house the videos that were designed to be consistent with the company's existing brand. The tutorials were developed using a combination of video capture and animation technology, and once they launched, Capario continued to employ the video production services of DDA as the portal's services expanded with new product releases.